Congratulations on the weight loss as well as the perseverance to keep up with the workouts. From your photos, it appears that you would be a very good candidate for a NO Drain, Rapid Recovery tummy tuck or abdominoplasty. You should get a great result and the rapid recovery would allow you to get back to your work outs within a couple of weeks. 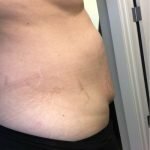 What type of tummy tuck is best? You pose an interesting question since there are many options for you and just as many surgeons will give you an opinion. What is most important is what your goals are. If your tummy tuck or abdominoplasty goal is to get rid of the excess skin in the lower tummy or below your belly button, then a simple lower tummy tuck or mini tummy would work well and have far fewer potential complications. This has the advantage of leaving you belly button in place, shortening the lower scar and meeting your wish to have less scaring. If you are wanting a tight abdomen above and below your belly button, then you might be best advised to have a full tummy tuck. You may also need a full tummy if you have a lot of loose skin above the belly button or umbilicus. Sometimes we can lower the umbilicus a little without leaving a scar around it and that may be ak alternative. No matter, you should always get a consultation to help you determine what kind of tummy tuck you need to get the results you are looking for. Make sure you chose a surgeon who is a member of the American Society for Aesthetic Plastic Surgeons. This not a guarantee that you will be getting the best but at least you will know your surgeon will have met certain criteria that make them among the best. In addition look for a surgeon who will do a NO Drain, Rapid Recovery tummy tuck. This reduces complications and drastically reduces your down time. I have added a web reference and a video that gives you information on this. It is always best to be as close to your ideal body weight as possible before a tummy tuck. This will help to get the best possible results and decrease your potential for complications. However, some patients find that last 20 or 30 pounds hard to lose and the results of a tummy tuck can act as a motivator to finish up the weight loss. It really depends upon what you think will work best for you. 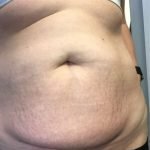 Would it be possible for me to attend class three times a week for a couple of hours after my tummy tuck? If you had a NO Drain, rapid recovery tummy tuck, you could easily be back to your desk job or back to classes at school within a couple of days. While many do not think this is possible, I have added a video testimony of a woman who had this done and she was able to get back to her regular life very quickly. A tummy tuck or abdominoplasty would be an excellent solution for the excess skin in your abdomen and help a lot the protuberance that your profile photo shows. While a tummy tuck is not so that you can wear a bikini it would help you look considerably better in clothing. As you look for a surgeon be sure to search out one who is certified by the American Board of Plastic Surgery and preferably a member of the American Society for Aesthetic Plastic Surgery. This will give you the best chance of finding a reputable surgeon who will get a good result for you. In addition, I would suggest that you find a surgeon who uses a no drain technique as well as a rapid recovery protocol. This will drastically reduce your downtime as well as your potential complication rate.